Hi5-12G-TR converts a 4K/UltraHD/2K/HD 12G-SDI single link input or a Fiber LC source from up to 10km away with eight channels of embedded digital audio to an HDMI 2.0 output with two or eight channels of audio. The included Fiber LC transceiver in the Hi5-12G-TR allows a 4K/UltraHD SDI or Fiber source signal to be sent to an HDMI destination with pass on of the source through SDI or Fiber to a secondary destination. 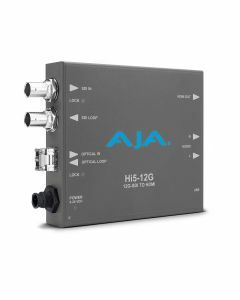 The Video Source Auto Switch Over feature (SDI and Optical Inputs) in Hi5-12G-TR acts as a redundant signal switch with Switch Over Priority selection (Last Valid Input, Priority SDI, and Priority Optical).